Well, my benchrest isn’t in a barn but it is inside my home, and shooting a 10-inch barrel .22 Hornet T/C Contender handgun out the window, I routinely print 1-1/4-inch groups at 100 yards. One key to this accuracy is holding the gun rock steady. I put a short Harris bipod on the handgun and also rest the pistol grip on a small sandbag, tweaking it with my free hand as I aim and shoot. Another key is that the gun sports a Burris 3-12X long eye relief handgun scope. A third key is an excellent trigger. Since this gun is only shot from the bench, the trigger has been tuned down to a crisp 1-pound pull that lets go without disturbing the sight picture. While the Hornet is fun to shoot with negligible felt recoil and moderate muzzle blast, my favorite woodchuck gun is a Competitor pistol in .22-250. It delivers sub MOA groups with hand-loaded 40-grain Sierra BlitzKings leaving the 16-inch barrel at 3,400 feet a second. It weighs 6-3/4 pounds, so recoil is negligible here, too. For field hunting from a rest, this trigger is adjusted to a crisp 2 pounds. While that qualifies as exceptional performance from a special gun, the notion that shorter handgun barrels are somehow inherently inaccurate is a complete misconception. Most well-made revolvers, even with barrels as short as 4 inches, are capable of 6-inch groups at 100 yards when shot with the right ammo from a Ransom Pistol Rest. That equates to 3-inch groups at 50 yards, perfectly adequate for deer or bear. Better centerfire revolvers, with 6- to 9-inch barrels, consistently deliver 2-inch groups at 100 yards, comparable to a big-game rifle. Just about every experienced rifle shot who has tried one of my long-range handgun rigs from the bench (and that’s most of my friends) has described it as an eye-opening experience. Shooting the Hornet, they rarely miss a 10-inch Caldwell gong set at 160 yards. When shooting a rifle on a bipod from the prone position, the only wavering comes from movement by the shooter’s shoulder or cheek. With a handgun on a bipod and a sandbag under the grip, even this slight movement is reduced. That three-point rest can be absolutely rock-steady, leaving the shooter to concentrate on a smooth and steady trigger pull. Typically, it is easy to install a stud for a bipod on a handgun with a forend, and Harris makes a clamp adapter for most other guns, also providing a sling swivel stud to which the bipod clips. My “sandbags” are actually 5-pound shotgun shot bags filled with the plastic pellets used to mold various plastic things. They work well and are super-light for easy carry. While scope magnification makes it easier to see a distant target and define the crosshair on the target, equally important to me is the assurance it provides that the barrel is not wobbling off target. If I see the crosshair wavering a bit, but staying within the effective kill zone of the game, I squeeze the trigger. But if the crosshair is weaving on and off, I know I need to get steadier before pressing the trigger. I just can’t be that sure of the shot when aligning sights with no magnification. Shooting a handgun accurately comes down to this combination of steadiness, sight alignment, and trigger control. I start most of my handgun “students” with a scoped target-grade Smith & Wesson Model 41 .22 autoloader on a bipod with a sandbag under the grip. 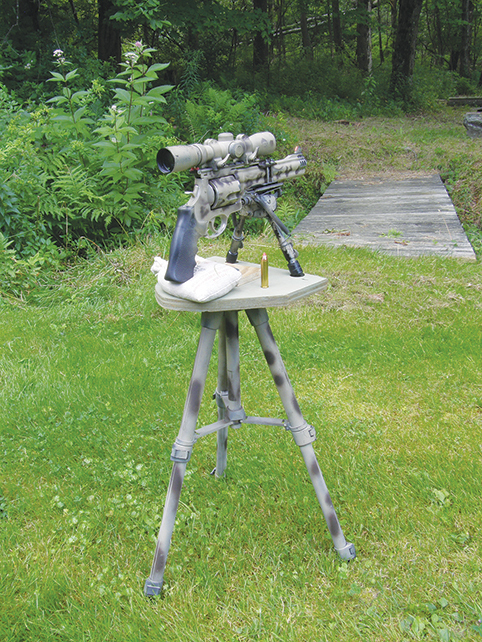 The bipod and sandbag address the steadiness issue, the scope minimizes sight alignment problems, and then the student may concentrate on slowly pressing the trigger straight back. Shooting this rig from the bench, they break Necco candy wafers at 25 yards with just about every shot. It’s amazing what consistent hits on such small targets can do for a shooter’s confidence, and there is no need to pick up the mess! Then I move the wafers out to 50 yards and switch them to the Hornet for even better accuracy. They seldom miss here, either. In fact, an experienced rifle hunter will usually print a 2- to 3-inch group at 100 yards the first try, and quickly improve from there. Day two, we’re back to a .22 autoloader. But this time the scope is on raised See-Thru mounts, and we aim with the iron sights under the scope tube. The short sighting radius of a handgun barrel demands more precise alignment of iron sights than a rifle shooter is accustomed to needing. Yet once they get really fussy about that alignment, they do OK.
Now I remove the bipod, and they shoot with just one sandbag forward of the trigger guard. Even though they are still shooting off the bench, and also back to sighting with the scope, the groups tend to get bigger—a lot bigger. As a reinforcing example of what not to do when hunting, they next take a few shots offhand. This usually dispels any lingering doubt about the need for a steady hold. Several of my big-bore hunting handguns shoot 4-inch groups at 100 yards. These include a Ruger Security Six .357, 4-inch barrel; an S&W Model 629 .44 Magnum, 4-inch barrel; and a Dan Wesson .44 Magnum, 8-inch barrel. The select few that consistently shoot 2-inch groups include an S&W X-Frame .460, 8-3/8-inch barrel; an S&W Model 629 Performance Center .44 Magnum, 7-1/2-inch barrel; a Freedom Arms .454 Casull, 7-1/2-inch barrel; a Competitor Arms .35 Whelen, 16-inch barrel; a Competitor Arms .300 Win. Mag., 16-inch barrel; and a few T/C Contenders and Encore handguns in big-game rifle calibers. If you’re interested in hunting deer with such a handgun, or bear over bait, I suggest you build an 18-inch-square platform and attach it securely to the tree stand rail in front of you. Done right, it can be about as steady as the bench. I affixed a small platform to a lightweight Caldwell tripod that is just the right height to shoot from the kneeling position. It is perfect for woodchucks when I’m in the tall grass adjacent to a cut field or for deer while sitting on a short stool. A friend who likes to hunt deer from blowdowns carries two 14-inch squares of thin plywood and a few clamps. With these, he usually has no problem improvising relatively solid rests for his handgun. If you don’t want to carry a rest, try sitting on the ground and leaning back against a tree. Hunker down and place the bipod just behind your drawn-up knee; put the sandbag under the grip, again tweaking it with your free hand. Done right, it is surprisingly steady. Just be mindful of the hot jet at a revolver’s cylinder gap. Joe McCray and I have run bear hounds together for several years. I only carry handguns, and he has seen me take a few bears with them, usually when I was the only one at the tree with a gun. I don’t use a bipod for this upward shooting but am always looking to improvise a somewhat steady hold in the field. I always have a scope or an open red dot sight on the handgun. 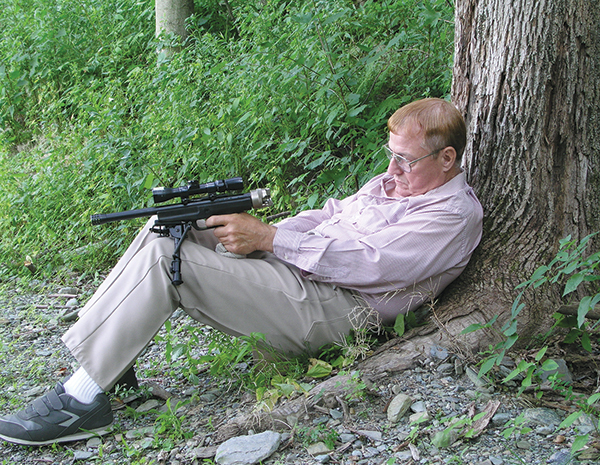 After graduating my home course in “handgun control,” Joe vowed to never again carry a long-barreled rifle through the Vermont mountain thickets, at least not when hurrying to catch up with the hounds. Last year, he responded to a friend’s call about a bear raiding beehives, which ended with the hounds running the No. 11 all-time Vermont bear and Joe taking it on the ground at 40 yards with one shot from a .44 Magnum revolver. One caveat here is that while riflescopes enhance visibility in dimming light, handgun scopes actually reduce it a bit. I recommend raised see-through mounts for the scope with fiber-optic sights on the barrel underneath, as a backup for black bears. There used to be, and still can be fashioned, sights that mount over a scope. With game-hunting seasons ended or winding down in most states, now is a good time to pick up a Harris S-BR swiveling benchrest bipod, maybe even a new handgun and scope at a great price. Practice at the range as the season warms and then hunt woodchucks with it later in the spring. By next fall, you should be ready for deer or perhaps even a top-11 bear of your own.